Please note that if you purchase only this item, the check-out screen will show a $5 shipping charge. Actual shipping for this item if ordered by itself is $3.00 for 1st Class Mail. Thanks. 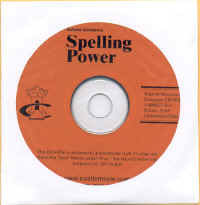 The CD-ROMs are included in the 10th Anniversary editions of Spelling Power and separately for a small cost to cover shipping and handling. Please note that the addition of the Bonus CD-ROM is the only change made in the 10th Anniversary edition of Spelling Power. You do not need to upgrade your book. If you have an earlier edition of Spelling Power, your book is the same as the 10th Anniversary Edition.